The title of the new series’ opening episode has been revealed as Asylum of the Daleks. We confirmed back in March that the Daleks would be returning to menace the universe and even posted a few sneaky photos smuggled from set! 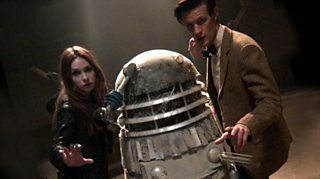 Since then, Steven Moffat (Doctor Who’s lead writer and Executive Producer) has confirmed that the adventure will feature every kind of Dalek ever faced by the Time Lord – including the legendary Special Weapons Dalek! The title of the new story has already increased the excitement building around it. Could the ‘asylum’ be a place or is it some sort of protection? Or does the word take on a new and sinister meaning in this adventure? It’s too early to say but we’re having fun speculating! In the meantime, we’ll have to wait a little longer to find out the answer to the crucial question: What is the Asylum of the Daleks?